کابل ساتا اکسپرس برای اتصال هاردهای SSD به مادربردهای حرفه ای جدید به کار می رود. The Serial ATA International Organization (SATA-IO) recently announced Serial ATA Revision 3.2 and with that comes the first implementation of SATA Express. You know what SATA Express is right? It is the new specification that blends PCI Express with Serial ATA to come up with a super faster interface that alleviates the SATA bottleneck that we’ve run into with the majority of high-end Solid-State Drives (SSDs). The SATA III specification allowed for up to 6Gbps (600MB/s), which was fast back in the day, but now with the new the SATA Express standard you can expect to speeds of up to 16Gbps (1.97GB/s) very soon. 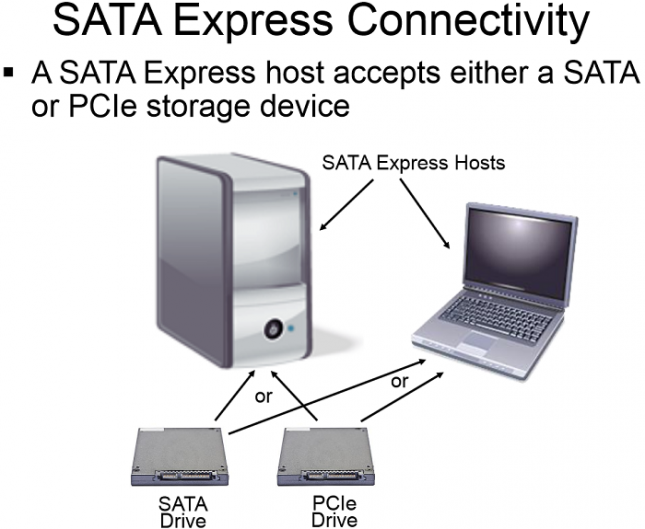 The SATA Express standard supports both SATA and PCIe storage solutions, unfortunately you can’t run both in tandem. Basically this means that if you plug in a SATA device that you’ll be using just SATA and if you plug in a PCIe device you’ll be running through only PCIe. The drive tells the host if it is PCIe of SATA. If you are running a PCIe device there will be 2 lanes of PCI Express available and that means you have the ability to have up to 16 Gbps (1970MB/s) of performance (8Gbps per lane) on PCIe Gen 3.0 or up to 10 Gbps (1000MB/s) on PCIe Gen 2.0. The PCI Express bus that you are running on and what bus the PCIe controller supports on the storage device is crucial. 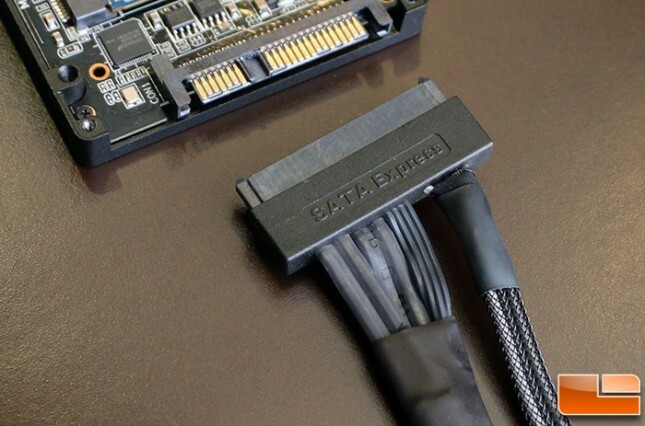 SATA Express (abbreviated from Serial ATA Express), initially standardized in the SATA 3.2 specification, is a computer bus interface that supports either Serial ATA (SATA) or PCI Express (PCIe) storage devices. 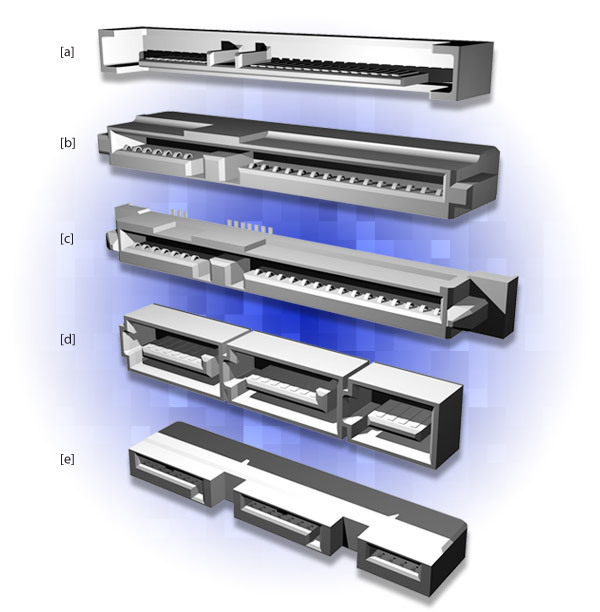 The host connector is backward compatible with the standard 3.5-inch SATA data connector, while it also provides multiple PCI Express lanes as a pure PCI Express connection to the storage device. Instead of the usual approach of doubling the speed of SATA interface, PCI Express was selected for achieving data transfer speeds greater than 6 Gbit/s. It was concluded by the designers of SATA interface that doubling the native SATA speed would take too much time, too many changes would be required to the SATA standard, and would result in much greater power consumption when compared to the existing PCI Express bus. The upcoming Intel 9 series of chipsets will natively support one SATA Express device, so get ready to hear all about SATA Express for years to come. 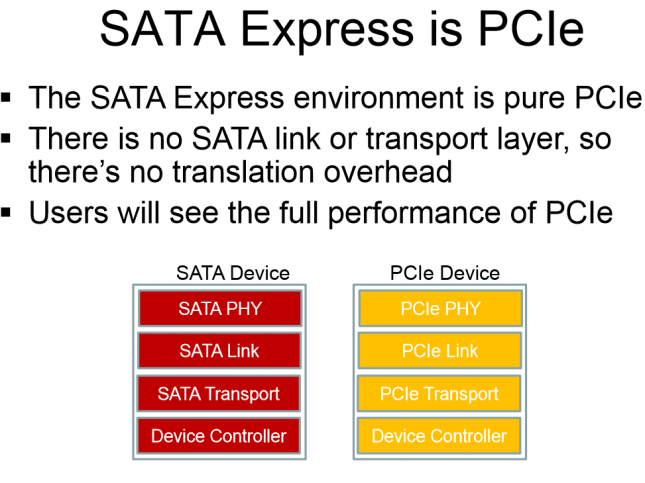 Intel’s SATA Express implementation uses a pair of PCH PCIe Gen 2 lanes along with two SATA III ports for SATA Express. This means that it is limited to around 10Gbps (1000MB/s) when it comes to the data rate. This means that you won’t be tapping into the full power of the SATA Express specification right now since PCIe Gen 3 lanes aren’t being used, but it is 67% faster than that you get from a single SATA III solution. When it comes to real world sequential read/write performance, you are looking at up to 745/809MB/s on a SATA Express drive like the ASUS Hyper Express, which uses a pair of mSATA SSDs in RAID to get that performance. ASUS says users of their boards with SATA Express with the Hyper Express drive will be able to move a 10GB movie file in about 10 seconds. Running a pair of SATA III SSDs in RAID that are able to saturate the SATA III bus is similar to this, but it is in the same ball park as a SATAe device that is able to max out its bus. Computer users will be able to get 2000MB/s SATA Express performance once the chipset and controller companies move over to PCIe Gen 3 lanes. Some might be disappointed by this, but it doesn’t really matter today as there aren’t any PCIe Gen 3 PCH designs or SSD controllers available and you need both of those components to be updated to get close to that 20Gbps theoretical limit. It is obvious that Intel already supports SATA Express in the upcoming 9 series of chipsets, but we are highly doubtful that AMD will introduce support for SATA Express in any chipsets or SoC processor designs in 2014. There is no word on when PCIe Gen 3.0 lanes will be included on the chipset side, but we know that Intel, LSI/SandForce, Marvell and Samsung are working on both PCIe Gen 2 x4 and PCIe Gen 3 controllers. One that should be coming to market later this year is the LSI SandForce SF3700 Flash Controller that was announced in November 2013. The image above shows plug (a) which is built for attaching to a PCIe device. Socket (b) would be part of a cable assembly for receiving plug (a) or a standard SATA plug, and Socket (c) would mount to a backplane or motherboard for receiving plug (a) or a standard SATA plug. The last two connectors are a mating pair designed to enable cabling (e) to connect to desktop PC motherboards (d). Here is an example of a real SATA Express cable and drive that we recently got to spend some hands on time with. One of the really neat things about the SATA Express data connector is that it backward compatible. So, if you aren’t using the standard 3.5-inch SATA data connector you can use the two standard SATA data ports to connect legacy devices to the system. 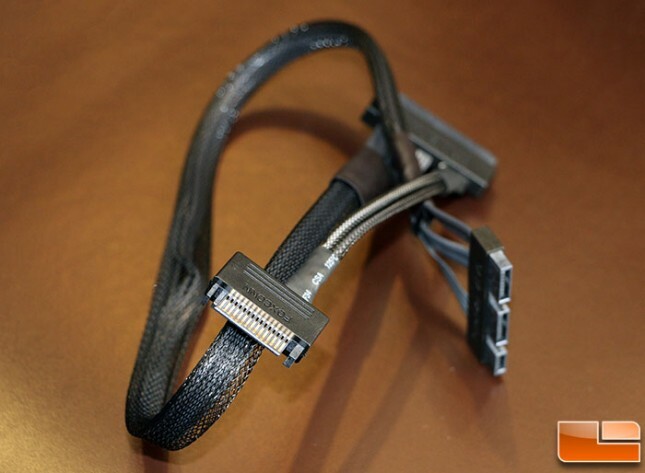 It should be noted that the SATA Express cable delivers power, so there is an end that needs to be plugged into a power supply through a 15-pin SATA or 4-pin molex connector as SATAe devices will require power. It appears that SATA Express cables will not come with the motherboard, but will rather come with the SATA Express device or will need to be purchased on their own for the time being. The SATAe connector is pretty massive at nearly two inches in length and not every Small Form Factor (SFF) system out there can fit a SATA Express connector on the board as there isn’t enough real estate for one. 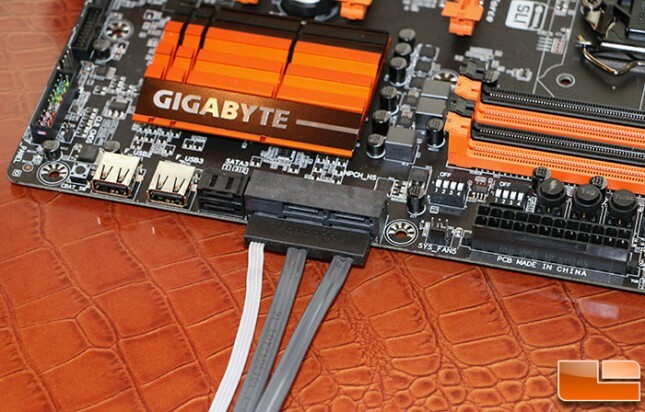 Many companies appear to be skipping the SATA Express interface and using an m.2 slot on mini-ITX boards due to the limited motherboard real estate available. M.2 is just a form factor though and is part of the SATA Express standard as well. SATA Express also supports various host controller interfaces. You have the usual support for AHCI (Advanced Host Controller Interface), but SATA Express also supports Non-Volatile Memory Express (NVMe). NVMe looks really promising as it was designed from the ground up for SSDs and PCIe storage solutions. The bad news is that it is still some time away from being useful to consumers since Windows 8.1 isn’t fully NVMe ready and does not provide SATA software compatibility. Basically you can get a device running NVMe working in Windows 8.1 right now, but not as a boot device. NVMe is clearly the front runner to be the premier host controller interface and that will likely happen with the next version of Microsoft Windows is released. When it comes out you can expect to see better performance and latencies.